Suicide Squad’s ensemble photo from several weeks back gave us our first look at Adewale Akinnuoye-Agbaje as Waylon Jones, a.k.a. the ferocious Batman villain Killer Croc. 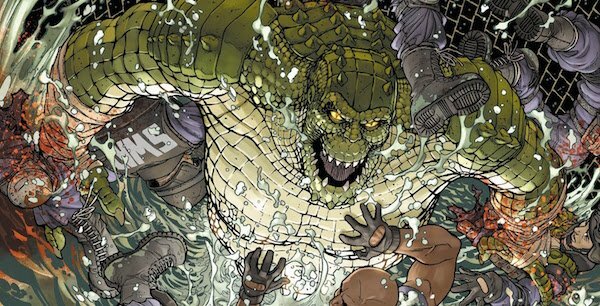 While David Ayer and the film crew have yet to give the character his own portrait (an honor so far only awarded to Deadshot), we now have the next best thing: a full-body of Akinnuoye-Agbaje made up as the cinematic Killer Croc, and he looks terrifying! Take a look. If you were one of the people who thought that Suicide Squad’s Killer Croc would be a CGI creation, think again. As the picture from Twitter user Thalia Worldwide shows, practical effects are being used on Akinnuoye-Agbaje to bring the reptilian villain to life. Rather than adapt the character’s modern look of what is basically a humanoid crocodile (similar to Spider-man villain The Lizard), the film has opted to adapt the grey-skinned, mutated look from the character’s earlier appearances, and the result is impressive. This is one guy you definitely wouldn’t want to run into down in the sewers…although now that I think about it, most of the people down in the sewers probably aren’t good company. Akinnuoye-Agbaje was first reported to be playing Killer Croc in Suicide Squad in April. At the time, his role in the film’s plot wasn’t disclosed, but as the team photo and leaked set images have since revealed, Croc will be one of the Squad’s members. Like most of the team’s villainous members, Croc will likely going on high-risk missions for the Squad in exchange for a reduced prison sentence or other form of leniency from the U.S. government. If this photo is any indication, at some point in the story Croc will ditch his sweatshirt and jacket and go shirtless for a bit. Here’s hoping it’s for a brutal fight scene, preferably against an opponent well matched to take him on. Judging by those teeth and claws, a normal human being would get shredded going up against Croc. Killer Croc has been an adversary of Batman’s since 1983, and while this will be the character’s live-action debut, his past appearances in other media include Batman: The Animated Series and Batman: Arkham Asylum. Croc will be appearing in Suicide Squad alongside other DC character’s like Will Smith’s Deadshot, Margot Robbie’s Harley Quinn, Jai Courtney’s Captain Boomerang, Cara Delevingne’s Enchantress and more. Filming on Suicide Squad began on April 13 in Toronto, and will conclude on August 30. You can watch Killer Croc in action alongside the rest of the team when the film hits theaters on August 5, 2016.